A simple and easy-to-use platform that provides centralized access to all risk-related information and allows risks to be managed efficiently. Increase Risk Mitigation Effectiveness: identify, assess and mitigate key risks facing your company. Get real time updates on Risk Mitigation Effectiveness status. Accurately measure the size and importance of all risks in your organization. Prioritize treatment for risks demanding urgent attention. 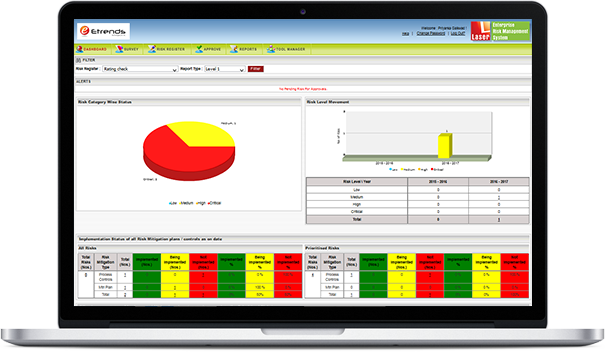 Intuitive and user-friendly dashboard provides comprehensive information in a single window for the top management. Create surveys, add risks, add activities, assign owners and set deadlines to create a powerful Risk Mitigation Action Plan. Automatic reminders to activity owners on pending activities and automatic escalation of activities that have missed deadlines. In-built workflow to approve creation and modification of risk registers and risk mitigation plan. Complete control to configure the Masters completely as per individual organization requirement. To download the features of LERMS® etc features, please click here.